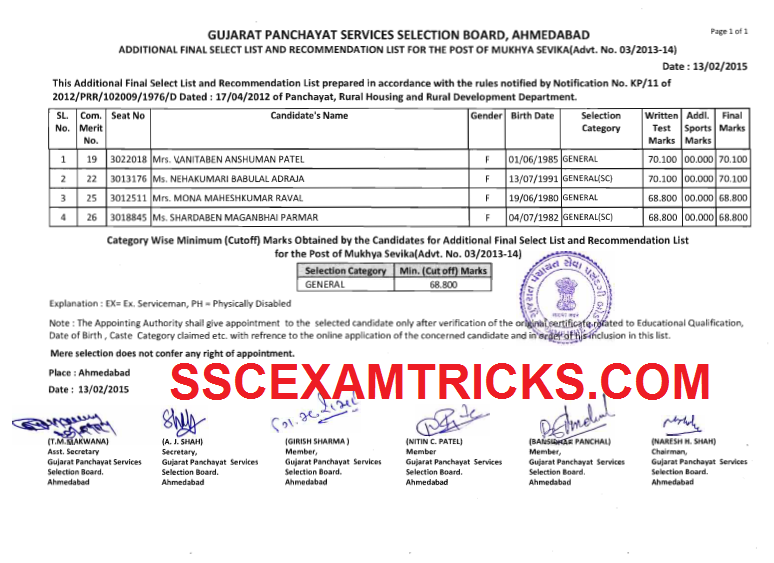 Gujrat Panchayat Service Selection Board, Ahamedabad has released final result / Final Selection List and Recommended List on 13th February 2015 for the posts of Staff Nurse Additional Assistant Engineer Nayab Chitnis Mukhya Sevika against the advertisement no. 01/2013-14 on the official website. This additional Final Selection List and Recommended List prepared in accordance with the rules notified by Notification No. KP/11 of 2012/PRR/102009/1976/D dated 17/04/2012 of Panchayat, Rural Housing and Rural Development Department. This list comprised of Merit no., Seat Number, name of the candidates, Gender, Date of Birth, Selection Category, Written Test Marks, Additional Sports Marks and Final Marks of the candidates. It is noted that the appointment authority shall give appointment letter to the selected candidate only after verification of the original certificate related to Educational Qualification, Date of Birth and Caste Category Claimed etc. with the reference to the online application of the concern candidate and in order to the inclusion of this list. GPSSB has also released Final Cut off marks and marks obtained by each candidate. The Finally selected candidates must bring original document before getting appointment/ Joining date of these posts. Those candidates who had appeared in the written examination and waiting for the final result/ Final Merit list / Final Cut off marks of the selected candidates can download their Final Result/ Final Merit list from the direct link provided in the end of the posts. The Finally Selected Candidates for the posts of Staff Nurse Additional Assistant Engineer Nayab Chitnis Mukhya Sevika should bring and deposit the list of document which is provided below at the time of receiving appointment letter from the authority. The appointment Letter will contain the date of joining and reporting time along with venue of appointment. The candidate will have to report at the venue mentioned in the appointment letter on the fixed date.